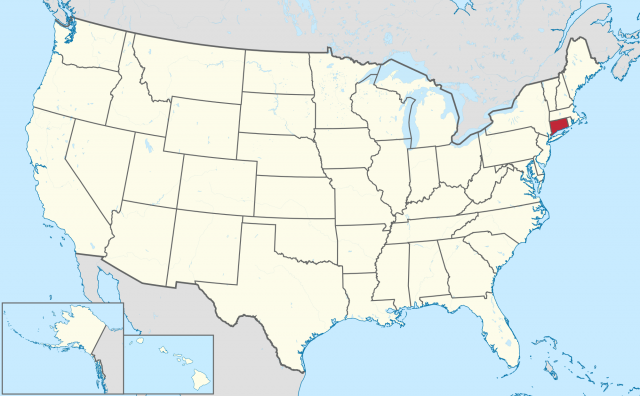 CONNECTICUT IS the southernmost of the New England states in the northeastern UNITED STATES and has borders with MASSACHUSETTS in the north, NEW YORK in the west, and RHODE ISLAND to the east. There is also a very small area in the very northeast corner where Massachusetts extends south creating an eastern border. To the south, the Long Island Sound separates Connecticut from New York’s Long Island, while Block Island and the Block Island Sound separate the coastal region from the ATLANTIC OCEAN. The state has a roughly rectangular shape, extending approximately 90 mi (145 km) from east to west and 55 mi (90 km) from north to south. There is a very small protrusion in the southeast that juts into New York along the Long Island Sound. With an area of 5,009 square mi (12,973 square km), Connecticut ranks 48th nationally in size. With a population of 3,405,565, however, the state ranks 29th nationally in total population and is 4th in terms of population density, with 703 persons per square mile (1,821 per square km). But the high-density ranking does not mean there is not a rural feeling as you travel around the state. Most of the people live in or around Hartford (the capital) or within the corridor that extends southeast to New Haven (home to Yale University), Bridgeport (the largest city at 135,529) and New York. Overall, the state’s 10 largest cities account for only 28 percent of the state’s population. The state is easily divided into three distinct regions on an east-west basis, plus a narrow coastal region running east-west that provides a north-south distinction. The land in the west is part of what is generally referred to as the Western Highlands, a landform that extends northward into Massachusetts and Vermont. Here the land slopes downward as you move south and east. Steep hills, sharp ridges, and numerous streams characterize the rugged beauty of the Berkshires, part of the Taconic Mountains in the very northwestern portion of the state between the Housatonic River and the New York border. The state’s highest point of 2,380 feet (725 m) above sea level is here on the southern slopes of Mount Frissell, whose main peak at 2,453 ft (748 m) is on the Massachusetts side of the border. The heavily forested Eastern Highlands, which extend from the Connecticut Valley lowland northeastward to MAINE, are not as high as the Western Highlands. Running north-south down the middle of the state following the Connecticut River is the Connecticut River Lowland, a narrow strip of land approximately 30 miles wide (48 km), characterized by numerous small rivers and low hills. The southern coastal lowlands run along the southern shores of the state where the land meets the Long Island Sound. The area varies from 6 to 16 mi (10 to 26 km) wide, contains numerous beaches and small harbors, and, because of the protection offered by Long Island, has become a popular summer resort retreat. The Dutch were the first Europeans to explore the area when Adriaen Block sailed through Long Island Sound and explored the Connecticut River in 1614. By 1633, the Dutch had built a small fort near present-day Hartford, but the area was abandoned in the 1650s as more and more English settlers arrived. As the Puritans came in increasing numbers, the population expanded so that by 1662, when the colony received a legal charter from the English to exist as a corporate colony, there were more than a dozen towns. Connecticut was the fifth of the original 13 colonies to ratify the new constitution, officially becoming a state of the United States in January 1788. After the Embargo Act of 1807 ruined the shipbuilding industry, manufacturing became the centerpiece of the state economy as increasing numbers of tradesman came to the area. The manufacture of firearms was one of the mainstays of the economy in the late 1700s, as craftsman worked to turn Connecticut iron into patriot guns. Eli Whitney, inventor of the cotton gin, opened the first modern factory to massproduce materials when he founded a firearms factory to produce guns with standardized interchangeable parts at New Haven in 1798. Textiles, silverware, sewing machines, and clocks and watches were among the state’s early manufactured goods. The insurance industry, long a key word associated with images of the state’s economy and Hartford, had its beginnings in 1810 when the Hartford Fire Insurance Company opened its doors for business. Today, although famed for its rural character and village atmosphere, most of the wealth in Connecticut is derived from industry. The state is an important producer of jet engines and parts, electronics and electrical machinery, computer equipment, and helicopters. Firearms and ammunition, first produced here at the time of the American Revolution, are still made, and Groton, where the first nuclear submarine was built in 1954, remains a center for submarine building. Because much of the manufacturing is related to military spending, Connecticut’s heavy industry remains subject to the periodic ups and downs of the U.S. military budget. Fortunately, the growth of financial, insurance, real estate, and service industries has more than offset any declines brought on by manufacturing downturns, helping to turn the state into one of the wealthiest in the nation. Connecticut ranks first in both per capita income ($40,702) and disposable income per capita ($32,655). Agriculture accounts for only a small share of state income. The state’s major agricultural products include dairy products, eggs, vegetables, tobacco, mushrooms, and apples. High-grade broadleaf tobacco used in making cigar wrappers has been an important agricultural crop since the 1830s. The fishing industry is relatively small and has been hampered recently by pollution in the waters of the Long Island Sound. Stone accounts for most of the income derived from mining as it has since the 1800s when the Brownstone Quarries at Portland provided stones for mansions and public buildings.